In a population of N families, 50% of the families have three children, 30% of the families have two children and the remaining families have one child. What is the probability that a randomly picked child belongs to a family with two children? In a class of 200 students, 125 students have taken Programming Language course, 85 students have taken Data Structures course, 65 students have taken Computer Organization course; 50 students have taken both Programming Language and Data Structures, 35 students have taken both Data Structures and Computer Organization; 30 students have taken both Data Structures and Computer Organization, 15 students have taken all the three courses.How many students have not taken any of the three courses? 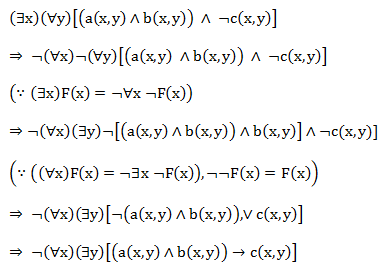 (x,z) ∈ R1R2, iff if there is a y ∈ B such that (x,y) ∈ R1 and (y,z) ∈ R2. 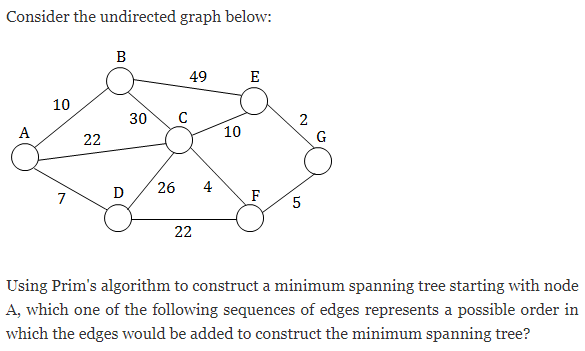 What is the maximum number of edges in an acyclic undirected graph with n vertices? Which one of the following regular expressions is NOT equivalent to the regular expression (a + b + c)*? With the given r.e. (a+b+c)* we can generate "a". From option 'c' we cannot be able to create a without b. So option is not equivalent. What is the minimum number of NAND gates required to implement a 2-input EXCLUSIVE-OR function without using any other logic gate? To create 2-input Exclusive-OR function we require 4 NAND gates. Deterministic automata can be able to recognize all the deterministic context-free languages. But non-deterministic ones can recognize all context-free languages. So, option C is false. What is the minimum size of ROM required to store the complete truth table of an 8-bit × 8-bit multiplier? What is the bit rate of a video terminal unit with 80 characters/line, 8 bits/character and horizontal sweep time of lOOµs (including 20 µs of retrace time)? Consider a system with 2 level caches. Access times of Level 1 cache, Level 2 cache and main memory are 1 ns, 10ns, and 500 ns, respectively. The hit rates of Level 1 and Level 2 caches are 0.8 and 0.9, respectively. What is the average access time of the system ignoring the search time within the cache? Let P be a singly linked list. Let Q be the pointer to an intermediate node x in the list. What is the worst-case time complexity of the best known algorithm to delete the node x from the list? Worst case complexity for deleting a node from singly linked list is O(1). Which one of the following is NOT shared by the threads of the same process? Threads cannot share the stack to maintaining the function calls and they can have individual function call sequences. 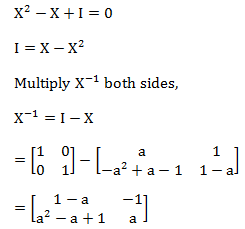 For x = 0, it gives 1. For x = 1, it gives 0. A software organization has been assessed at SEI CMM Level 4. Which of the following does the organization need to practice beside Process Change Management and Technology Change Management in order to achieve Level 5? 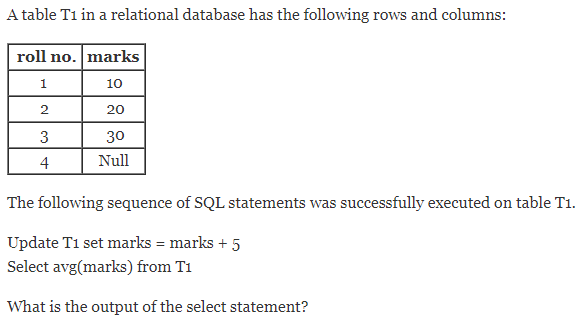 Which level of locking provides the highest degree of concurrency in a relational database? In page level locking, it will lock whole page i.e., all rows are highly restrictive. 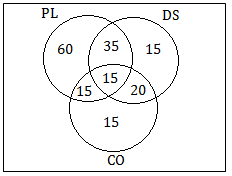 Table locking can be used for concurrency control with DDL operations. In row share table is less restrictive but it consists of highest degree of concurrency compared to page and table. Packet switching leads to better utilization of bandwidth resources than circuit switching. Packet switching results in less variation in delay than circuit switching. Packet switching requires more per packet processing than circuit switching. Packet switching can lead to reordering unlike in circuit switching. Sequence numbers can allow receivers to discard duplicate packets and properly sequence reordered packets. If the congestion is deleted, the transmitter decreases the transmission rate by a multiplicative factor. Acknowledgement allows the sender to determine when to retransmit lost packets. Sender can encrypts using the receiver public key and receiver decrypts it using his own private key. A subnet has been assigned a subnet mask of 255.255.255.192. What is the maximum number of hosts that can belong to this subnet? The answer is option (D), in a specified LAN technology - Ethernet is mentioned here. So, MAC addresses will be specifically taken as physical address which is unique in the entire world. In TCP, a unique sequence number is assigned to each byte. Which of the following objects can be used in expressions and scriplets in JSP (Java Server Pages) without explicitly declaring them? 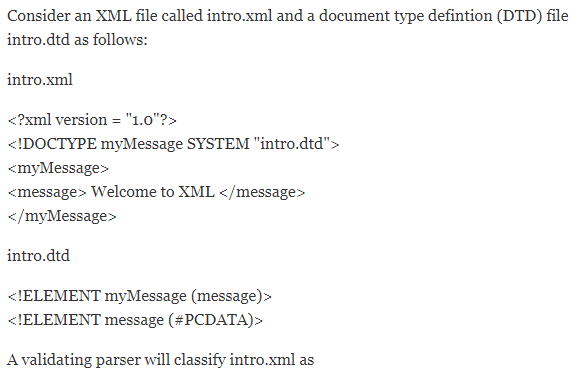 If two languages conform to the common language specification (CLS) of the Microsoft.NET framework. Then there are certain compliance rules which may be used for inheritance. So other statement (I) and (II) are True. Let p→q is conditional proposition here. p and q are compound propositions itself. Arguments to be valid if all combinations have to be tautology (like T→T, F→T, F→F) and its invalid if it have fallacy (T→F). If we somehow get this fallacy (T→F) then an argument is invalid. 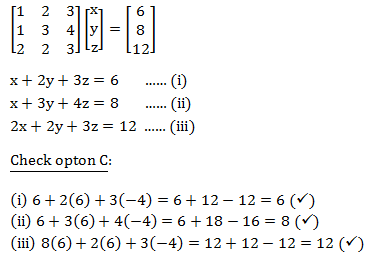 For options P and S you don't get any such combinations for T→F, so P and S are valid. For option Q: If we put p=F, q=T, r=T then we get T→F. So its INVALID. For option R: If we put p=F, q=F, r=F then we get T→F. So it is INVALID. 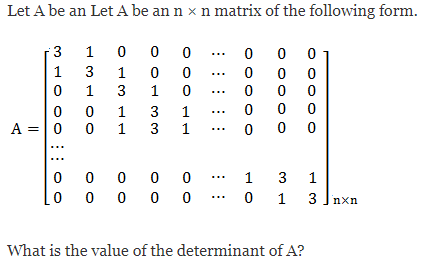 Put n=1, you will get a matrix like . 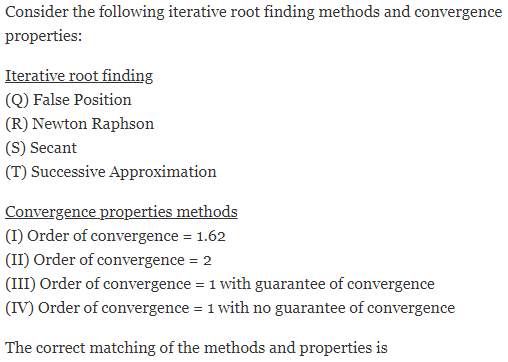 Find its determinant, Determinant = 3. (A), (B) can't be the answer. Now, check for n=2, Determinant = 9-1 = 8. 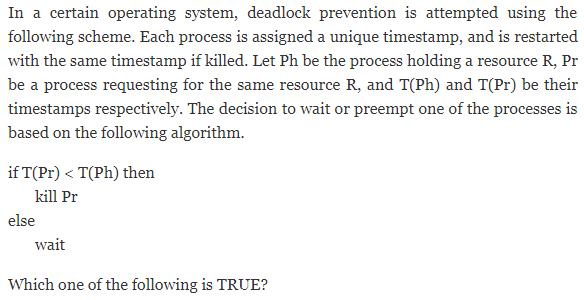 So, (D) is the answer. In how many ways can we distribute 5 distinct balls, B1, B2, …, B5 in 5 distinct cells, C1, C2, …, C5 such that Ball B, is not in cell Ci, ∀i = 1, 2, …, 5 and each cell contains exactly one ball? What is the number of vertices in an undirected connected graph with 27 edges, 6 vertices of degree 2, 3 vertices of degree 4 and remaining of degree 3? If f(1) = 2, f(2) = 4 and f(4) = 16, what is the value of f(3) using Lagrange’s interpolation formula? Now, here transition ((s,a,t), (s,a)) implies reading input symbol 'a' in the state 's' we have to move 's' having any symbol on the top of stack ... epsilon here implies "anything on of Top of stack". Now, observe the PDA carefully, it is saying that in the starting you have to push one 'a' for each of 'a' and 'b'. And in the end you have to pop one 'a' by one 'a' by one 'a' or one 'b'. Thus the count of a's and b's in first half of the string should be equal to second half of string. Now to move from first half to second half we are required one 'a', i.e., moving from s to f.
So, all odd strings in which 'a' is the middle element will be accpeted. Thus in our question, option (B) is aabab having 'b' in the middle and thus can't be accepted. 1) Sign bit of two input numbers is 0, and the result has sign bit 1. 2) Sign bit of two input numbers is 1, and the result has sign bit 0. So, only (2) causes overflow. A serial transmission T1 uses 8 information bits, 2 start bits, 1 stop bit and 1 parity bit for each character. A synchronous transmission T2 uses 3 eight bit sync characters followed by 30 eight bit information characters. If the bit rate is 1200 bits/second in both cases, what are the transfer rates of T1 and T2? So, correct option is (C). Data forwarding means if CPU writes to a memory location and subsequently reads from the same memory location, the second instruction can fetch the value directly from the register used to do write than waiting for the memory. So, this increses the performance. So, total time would be 13 ns. Finally, 7 replaces 6, which is in block 5. We just have to see which option gives 1 whenever Ain is 1 and 0 otherwise. 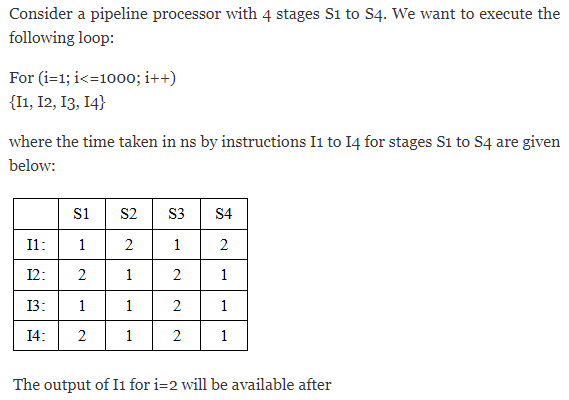 Since, CPU is having only 3 instructions, T3.I1 + T3.I2 + T3.I3 can be replaced by T3. In an enhancement of a design of a CPU, the speed of a floating point unit has been increased by 20% and the speed of a fixed point unit has been increased by 10%. 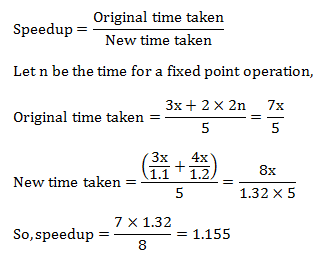 What is the overall speedup achieved if the ratio of the number of floating point operations to the number of fixed point operations is 2:3 and the floating point operation used to take twice the time taken by the fixed point operation in the original design? y μs is cycle time. x μs is data transfer time. 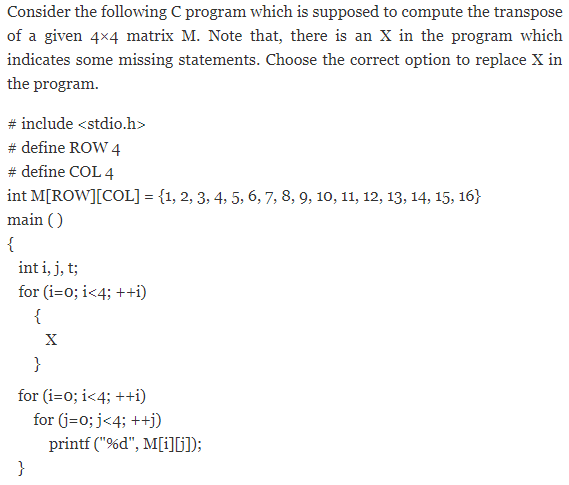 A program attempts to generate as many permutations as possible of the string, 'abcd' by pushing the characters a, b, c, d in the same order onto a stack, but it may pop off the top character at any time. 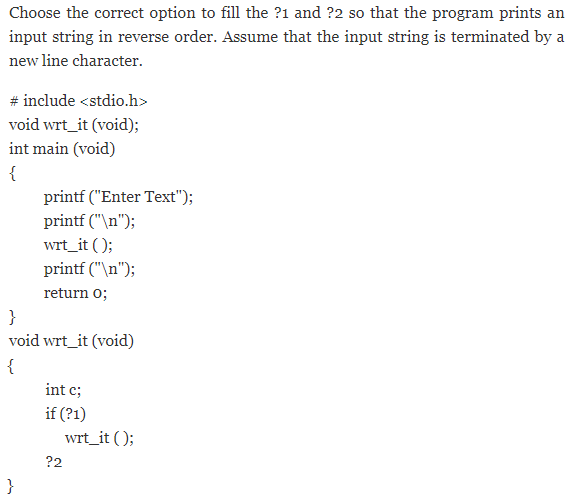 Which one of the following strings CANNOT be generated using this program? A) push 'a' and pop 'a', push 'b' and pop 'b', push 'c' and pop 'c', and finally push 'd' and pop 'd'. Sequence of popped elements will come to abcd. B) First push abcd, and after that pop one by one. Sequence of popped elements will come to dcba. C) push abc, and after that pop one by one. Sequence of popped elements will come to cba. Now push 'd' and pop 'd', final sequence comes to cbad. 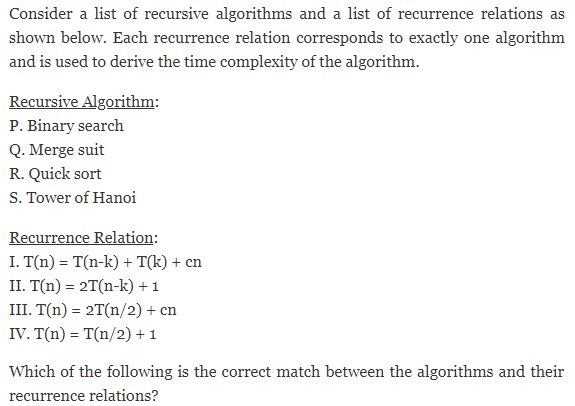 D) This sequence is not possible because 'a' cannot be popped before 'b' anyhow. 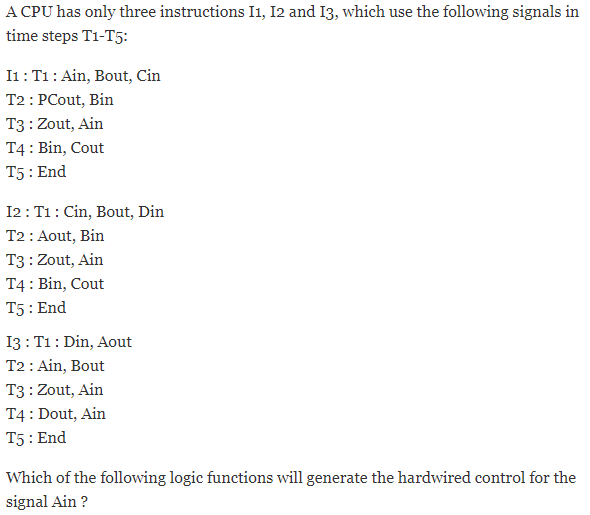 The above statement is actually algorithm for building a heap of an input array A. Which one of the following binary trees has its inorder and preorder traversals as BCAD and ABCD, respectively? So, f(n)g(n) = O(g(n)h(n)) is True. 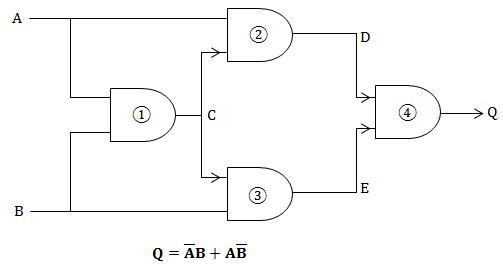 (A) and (B) produce disconnected components with the given order in options which is never allowed by Prim's algorithm. (C) produces connected component every instead a new edge is added but when first vertex is chosen (first vertex is chosen randomly) first edge must be minimum weight edge that is chosen. Therefore, (A, D) must be chosen before (A, B). Therefore (C) is false. To compute transpose 'j' needs to be started with 'i'. So, A and B are wrong. In (D) , given statements is wrong as temporary variable needs to be assigned some value and not vice-versa. In first case of funcf, which in turn calls funcg, y becomes 11 and it returns 5+11=16. In second call of funcg, y becomes 12 and it returns 5+12=17. So, in main y is incremented by 16+17=33 to become 10+33 =43. y will be incremented by 18+19=37 to give 43+37=80. getchar( ) = reads a single character at a time from the stdin. putchar( ) = writes a character specified by the argument to stdout. 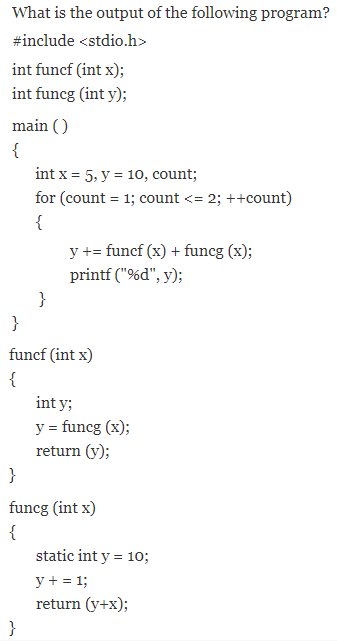 As getchar( ) and putchar( ), both are needed to read the string and prints its reverse and only option (D) contains both the function. (D) is the answer. Now coming to the code, wrt_id(void) is calling itself recursively. When \n is encountered, putchat( ) gets executed and prints the last character and then the function returns to its previous call and prints last 2nd character and so on. → f1 is call by value. The changes applicable only for local from f1. UV is printed. → Back in main( ), AB is printed. → Then in f2, VW is printed. Direction changes at 120, 110, 130. Direction changes at 120, 30, 130, 20. When the process washes up again after it has been killed once or twice, it will have same time stamp as it had when it was killed first time. And that time stamp can never be greater than a process that was killed after that or a new process that may have arrived. So, every time when the killed process washes up it might always find a new process that will say "your time stamp is less than me and I take this resource", which ofcourse is as we know, and that process will again be killed. So, starvation is possible, but deadlock is not possible. Process P1 is the producer and process P2 is the consumer. Semaphore 'full' is initialized to '0'. 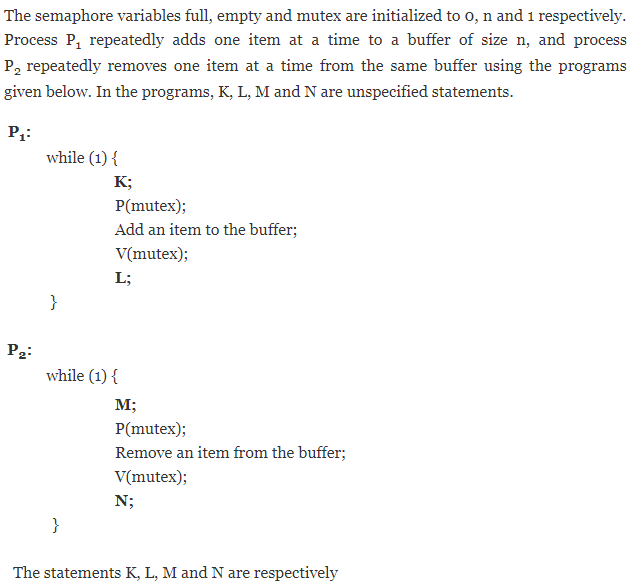 This means there is not item if the buffer semaphore 'empty' is initialized to 'n'. This means there is space for n items in the buffer. In process P1, wait on semaphore 'empty' signifies that if there is no space in buffer then P2 cannot produce more items. Signal on semaphore 'full' is to signify that one item has been added to the buffer. In process P2, wait on semaphore 'full' signifies that if the buffer is empty then consumer cannot consume any item. Signal on semaphore 'empty' increments a space in the buffer after consumption of an item. In a virtual memory system, size of virtual address is 32-bit, size of physical address is 30-bit, page size is 4 Kbyte and size of each page table entry is 32-bit. The main memory is byte addressable. Which one of the following is the maximum number of bits that can be used for storing protection and other information in each page table entry? Page table entry must contain bits for representing frames and other bits for storing information like dirty bit, reference bit, etc. In a particular Unix OS, each data block is of size 1024 bytes, each node has 10 direct data block addresses and three additional addresses: one for single indirect block, one for double indirect block and one for triple indirect block. Also, each block can contain addresses for 128 blocks. Which one of the following is approximately the maximum size of a file in the file system? A software project involves execution of 5 tasks T1, T2, T3, T4 and T5 of duration 10, 15, 18, 30 and 40 days, respectively. T2 and T4 can start only after T1 completes. T3 can start after T2 completes. T5 can start only after both T3 and T4 complete. What is the slack time of the task T3 in days? Assume that the delivered lines of code L of a software is related to the effort E in person months and duration t in calendar months by the relation L = P* (E/B)1/3 * t4/3, where P and B are two constants for the software process and skills factor. For a software project, the effort was estimated to be 20 person months and the duration was estimated to be 8 months. However, the customer asked the project team to complete the software project in 4 months. What would be the required effort in person months? A software was tested using the error seeding strategy in which 20 errors were seeded in the code. When the code was tested using the complete test suite, 16 of the seeded errors were detected. The same test suite also detected 200 non-seeded errors. What is the estimated number of undetected errors in the code after this testing? One table for E1, two tables for E2 (A21, A22 and A21, A23) because we need to make a separate table for multivalued attribute to satisfy minimum 1NF condition that requires atomic attributes. It is in 2NF. For 2NF all non-prime attribute should be fully functionally dependent on key. 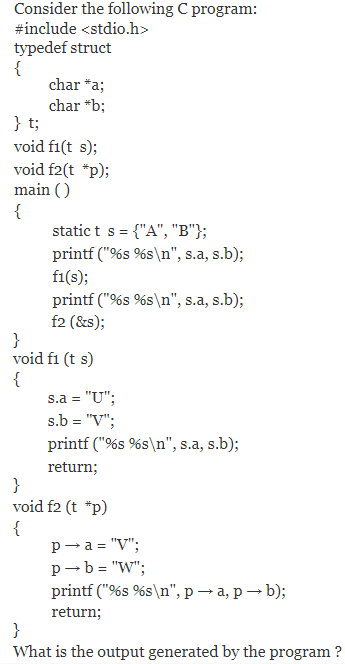 Here key is empcode and contains only one attribute, hence no partial dependency. But there is transitive dependency in this. Pincode → city, state, so it is not in 3NF. 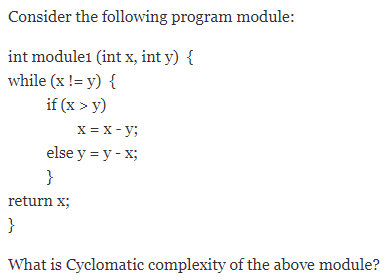 The given statement is not serializable as cycle exist in precedence graph. 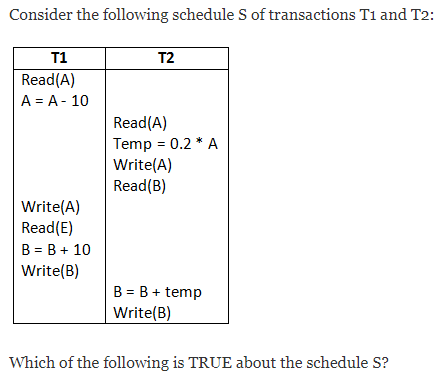 Therefore, options A, B, C, D are not correct. Here in (i), when we update in Student table, Dept_id = Null, then it will not cause any problem to referenced table. 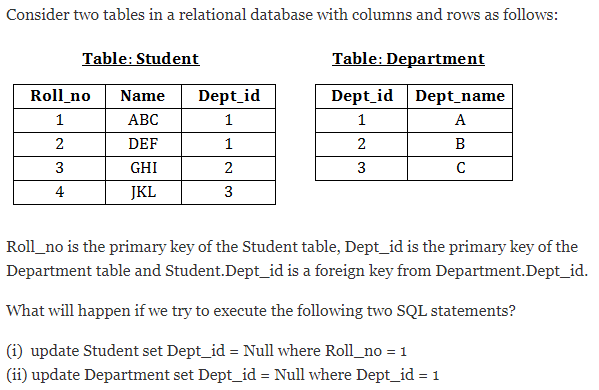 But in (ii) if we set in Department table, Dept_id = Null, then it will produce inconsistency because in Student table we will still have the tuples containing the Dept_id = 1. So, maximum value of p possible will be 23. In the data link layer, bits stuffing is employed then bit stuffing is done using the flag delimiter. If there is a flag of n bits then we will compare the data sequence with the flag and for every n-1 bits matched found, a bit 0 is stuffed in the data sequence. So, for a flag of 4 bits we will compare data sequence with a pattern of 3 bits, i.e., 011. In the above pattern the underlined bits are found matched. Hence, 0 in italics is stuffed. Thus resulting in the data sequence as 0110101100 which is option (D). For such a scheme to work properly, we will need a total of M+N distinct sequence numbers. A 20 Kbps satellite link has a propagation delay of 400 ms. The transmitter employs the "go back n ARQ" scheme with n set to 10. Assuming that each frame is 100 bytes long, what is the maximum data rate possible? Let x1, x2, x3 are data bits, and c1, c2, c3 and c4 are parity check bits. Now from above we can see that (I) and (III) are only codewords. Consider a simplified time slotted MAC protocol, where each host always has data to send and transmits with probability p = 0.2 in every slot. There is no backoff and one frame can be transmitted in one slot. If more than one host transmits in the same slot, then the transmissions are unsuccessful due to collision. What is the maximum number of hosts which this protocol can support, if each host has to be provided a minimum through put of 0.16 frames per time slot? In the TCP/IP protocol suite, which one of the following is NOT part of the IP header? Destination port number is not present at IP header. A TCP message consisting of 2100 bytes is passed to IP for delivery across two networks. The first network can carry a maximum payload of 1200 bytes per frame and the second network can carry a maximum payload of 400 bytes per frame, excluding network overhead. Assume that IP overhead per packet is 20 bytes. What is the total IP overhead in the second network for this transmission? 2120B reach R1's network layer. It removes original IP header, fragments data part at IP and then appends IP header to all fragments and forwards . So, it divides 2100 Bytes into two fragments of size 1200 and 900. And both fragments are sent to R2. Both fragments that reach R2 exceed MTU at R2. So, both are fragmented. First packet of 1200B is fragmented into 3 packets of 400 Bytes each. And second packet of 900B is fragmented into 3 fragments of 400, 400 and 100 Bytes respectively. So, totally 6 packets reach destinations. Suppose that the maximum transmit window size for a TCP connection is 12000 bytes. Each packet consists of 2000 bytes. At some point of time, the connection is in slow-start phase with a current transmit window of 4000 bytes. Subsequently, the transmitter receives two acknowledgements. Assume that no packets are lost and there are no time-outs. What is the maximum possible value of the current transmit window? which implies transmission is in slow start phase.